Ben 10 is an American animated series created by "Man of Action" (a group consisting of Duncan Rouleau, Joe Casey, Joe Kelly, and Steven T. Seagle), and produced by Cartoon Network Studios. The pilot episode aired on December 27, 2005, as part of a sneak peek of Cartoon Network's Saturday morning lineup. The second episode was shown as a special on Cartoon Network's Fridays on January 13, 2006. The final regular episode aired on April 15, 2008. The theme song for the show was written by Andy Sturmer and sung by Moxy. In April 2008, Ben 10 was succeeded by Ben 10: Alien Force. The next installment of the Ben 10 series will be titled Ben 10: Evolution. 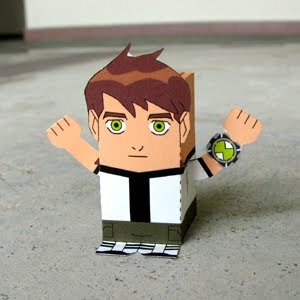 Download the PDF file here and make your own Ben 10 toy!